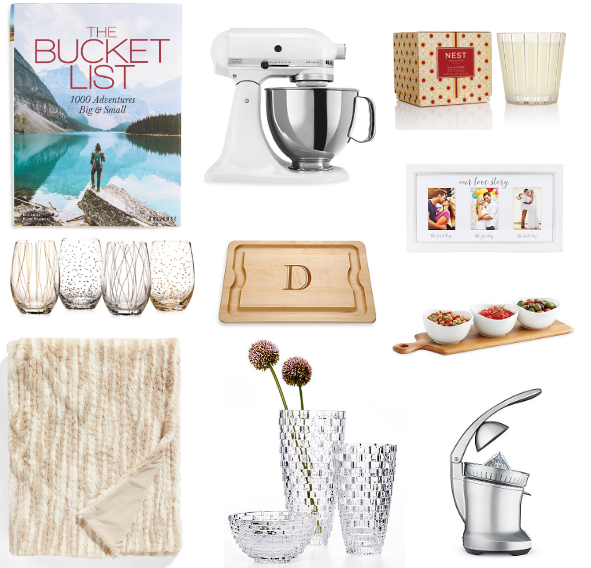 Killing two birds with one stone today and sharing some great gift ideas for the home & hostess as well as a few wedding registry must haves! I know we are getting down to the wire before Christmas but I made it easy for you last minute shoppers! All gifts are from Macy's, Nordstrom or Bed Bath & Beyond, so you can stop by your nearest location to shop! 2. candles - The holidays are the best time to gift a candle, in my opinion! I think they have such a homey, cozy feeling about them. I love the larger 3-wick size candles in yummy scents like sugar cookie! 3. Picture Frame - I know there are a million frames out there, but I really love the sentimental ones, like this one that tells 'our love story' for the newly engaged or newly married couple! I also love this one for your BFF or this one for a family member! 5. Faux fur throw blanket - I love this blanket & all of the soft shades it comes in! This blanket would be so cozy draped over a chair or the end of a bed. 7. serving dish - fill a serving dish with your favorite snacks or dessert & bring it as a hostess gift. Leave the dish at the end of the night! 8. coffee table book - I think this is such a great gift idea! I love the gorgeous photos that come along with all of these books. 10. Unexpected Appliance - Lots of households have the basic appliances & electrics but how about gifting something unexpected like an electric kettle or a citrus juicer? This is my last post until after Christmas so I want to wish you all the HAPPIEST, MERRIEST, MOST RELAXING Christmas weekend!!! Love all these picks! I am a huge fan of Nest candles. I love getting couple something unexpected!!! It's more fun because it's a surprise!! Yes, a surprise gift is always fun & thoughtful! Perfect list! I need to start selecting our wedding registry gifts, this helps! Thanks for sharing girl! What a fun task! Enjoy it! These picks are so cute. I love the wine glasses. I've been wanting a KitchenAid for so many years! Me too! It's at the top of my list!! Nice picks dear. And yes, Kitchenaid mixer is definitely a must-have! Definitely all about the stemless wine glasses! Super cute picks! These gifts are beautiful- I'm a sucker for a new set of wine glasses! They make such a great gift!